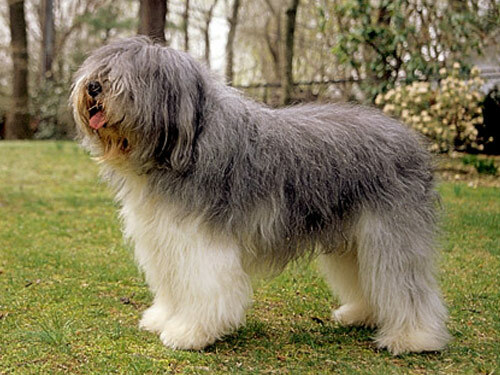 The Polish Lowland Sheepdog comes from a family of herding and livestock canines. It can be selfish or territorial at times, but it otherwise a very sweet dog. They enjoy barking and can be a showman when they feel like it. While their appearance can be playful and fun looking, they are rather serious animals with a independent nature. They can grasp rules quickly, but may not desire to follow them accordingly. They enjoy playing with most little ones, but can be very defensive if they encounter a situation with another canine. They bode a lot of energy and are fairly easy to train as pups. This breed makes excellent watchdogs and they can also provide some level of protection if necessary. The Polish Lowland Sheepdog is one that enjoys having a function in their family's lives other than just being a reliable and cuddly dog. They have so much energy to expend during the day that they can be very useful if living on a farm or being used to accompany their owner’s during the day to work. They require a decent amount of activity both mentally and physically. They can reside in colder temperatures with ease, and can tolerate warm ones for the most part. They have a signature long furry coat that will need to be groomed a few times per week. This breed will adore having an environment where they have the luxury of residing inside with their families, and still be able to play and roam outside freely. One wonderful treat when being the proud owner of a Polish Lowland Sheepdog is that they do not generally suffer from any major health issues like most canines do. On occasion the vet may recommend some basic screening tests for their hips and eyesight. They handle cold climates well, but should be monitored when residing in much warmer or hot ones. They typically live a healthy lifespan of ten to fourteen years long. The average weight is between thirty and thirty five pounds as full grown dogs.